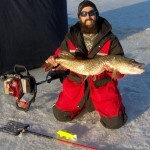 All Entries Tagged With: "northern pike"
The February 25 ice fishing class will focus on techniques for walleye, techniques for panfish, and setting polar tip-ups to target monster northern pike. 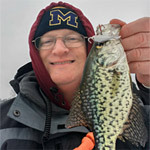 There are no snow days in ice fishing school – not when the principal is Freshwater Fishing Hall of Fame angler Mark Martin. 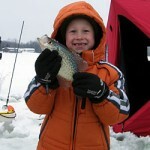 Unusually warm temperatures, wind and rain preceded the Feb 7 – 10 ice fishing class scheduled on Saginaw Bay. Fishing for Panfish is a blast, we all know that. However, if you really want a rush, try spearing. Yes, spearing through the ice is a blast. 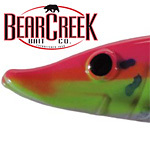 Proven effective for spear fishing for over 40 years, Bear Creek’s latest Spearing Decoy offering is the UV Electric Chicken color available in 3 styles. After nearly 75 years the MDNR spear fishing prohibition on Houghton Lake has been removed allowing additional angling opportunities on the 20,044 acre lake in Roscommon County. 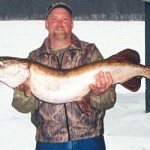 The 2012 Ultimate Fishing Show will have the first ever Ultimate Ice Fishing Tournament Weigh-In. 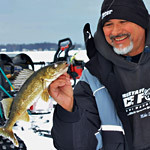 Twenty of the top ice fishing teams are vying for the Ultimate Ice Fishing National Championship title. Anglers will fish local lakes and bring their big catch to the Suburban Collection Showplace for the ice fishing show down. 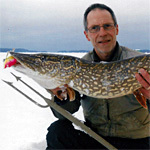 Using a combination of tip ups and bait rigs can improve your odds for catching more big Northern pike during the ice fishing season.